My So-Called Soundtrack: My Part-Time Cover: "Dark As A Dungeon"
My Part-Time Cover: "Dark As A Dungeon"
While "Dark As A Dungeon" was originally written by country legend Merle Travis (the same guy who wrote "Sixteen Tons") in the 1940's, there's no question that its popularity should be attributed to Johnny Cash's live version that he recorded for At Folsom Prison in the 1960's. Although it's looked at fondly in retrospect, at the time Cash's decision to perform prison concerts, much less release one as an album, wasn't met with much enthusiasm from his record label. However, not only did At Folsom Prison essentially revitalize Cash's drug-stalled career, it also allowed him to release another prison concert, At San Quentin, in 1969 that turned out to be Cash's first number one album to hit the Billboard Pop Albums chart. There were two performances that were recorded for At Folsom Prison and the setlists were surprisingly packed with songs about prison, death and sadness. Not surprisingly though, the prisoners ate up every note and lyric and the rowdy responses after (and sometimes during) the songs attest to their approvals. "Dark As A Dungeon" was recorded at both shows and during its first show performance, Cash started laughing at one of the prisoner's outbursts and smirkingly had to remind the rambunctious inmates that the show was being recorded. Wall of Voodoo is a band that I've got quite a soft spot for. But like all band-fan relationships, its got its touchy moments. In the early 1980's, they released three albums and an EP fronted by Stan Ridgway, a guy that I think has one of the most unique voices and most adventurous musical spirits in all of the New Wave/Alternative genre. 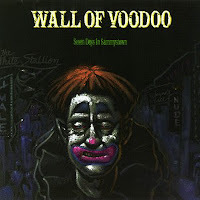 Unfortunately, due to drug use and behavioral problems, Stan and two other members left Wall of Voodoo after their performance at the second US Festival in 1983. The remaining members continued on with a new lead singer, Andy Preiboy, but kept the Wall of Voodoo name. Without Ridgway, the totally unique sound of the band, both vocally and musically, was forced to change and it was nowhere near as magical for me. While I don't really care for the Preiboy-fronted version of the band, there is one song I can pluck from that period that I really enjoy. 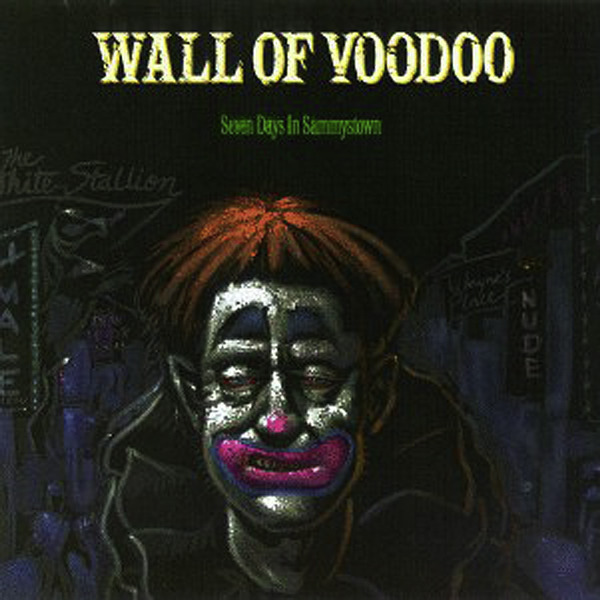 Their cover of "Dark As A Dungeon" from their 1985 release, Seven Days in Sammytown, is pretty awesome. The monotone vocals, synthesizer and industrial flavored electronic drumbeat combine perfectly to at least hint at the coolness of what the Wall of Voodoo name was known for. I could certainly do without the creepy clown artwork though.